Halloween is just around the corner, and what better way to spice up your crafting than to add a bit of “glow-in-the-dark” goodness to it? In regular light, these photo-reactive products have a white or pastel hue…but then turn off the light, PRESTO! You’ve got some glowing, spooky fun! Here’s a round-up of some fun GITD products/crafts you can try out for yourself! Both Fimo and Sculpey offer GITD clays that can be used alone or (in sparing amounts) mixed with other colors to tint. I’m partial to the Sculpey Shape and Bake Set (Glow in the Dark). You get 4 GITD colors (teal, yellow, orange and green, plus regular black and white) to stretch your imagination. Kids LOVE this set, because it appeals to both boys and girls. I mean, making glow-in-the dark robots or supervillians or fairies? Hello!! Uber-fun. Most major craft retailers will carry GITD clays, as well as some big-box stores. The sets retail for about $10.00.Â You can readily find it online, too. Skull Bead Tutorial from Creative Kismet– they use white clay, but grab your GITD clay and go wild! 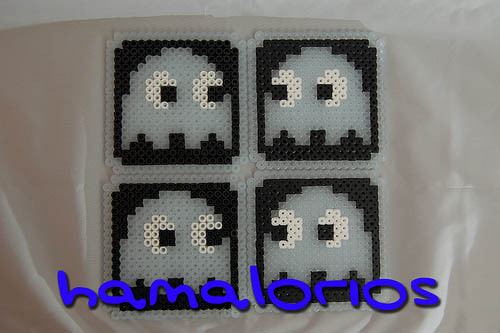 Remember Perler beads? 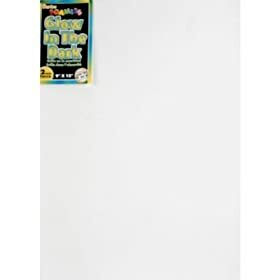 They’re those little rascally beads that you place on a pegboard in your favorite design, cover with parchement paper, and fuse together with your iron. 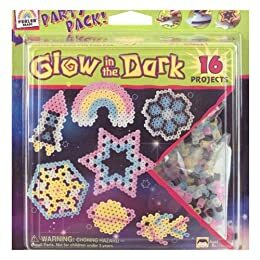 I remember these as a kid, and as long as your child is over 5 or so, this will amuse them to no end.Â Make magnets, mobiles, note clips, and more. Why not make a constellation of planets and stars and double-stick-tape them to the ceiling? I really like the freedom and creativity with this craft- you can let the kids do their own thing! While wandering up and down the sticker aisle, I found a plethora of “Foamies” stickers- moons, stars, combo packs, and the like. However for MY money, I dig the plain-old GITD foam sheet. It’s big (9X12) and cheap (under 2 bucks) and you can cut it, stamp it, sew it, or glue it! What about making your little one’s mask out of GITD foam? Soft on the face, and it’ll show up to passing motorists. Add a GITD crest to a plain ol’ cape to elevate you Super-hero to super-star heights! You can even cut shapes out of the foam and pin it on your pumpin instead all of the messy carving! Ok, enough GITD goodness for today…but there will be more tomorrow!